Miami snapped its 15-game winless streak two weeks ago. 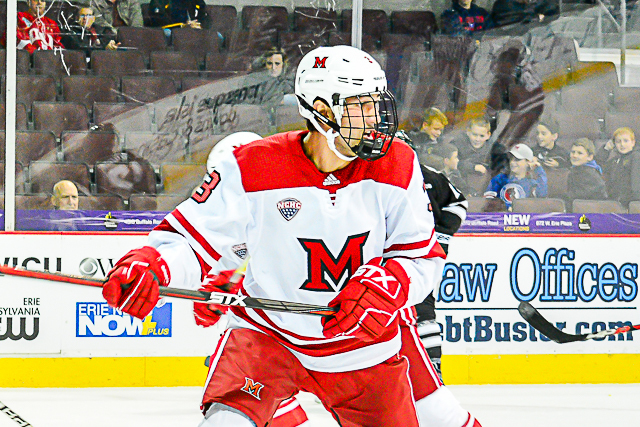 Next on the RedHawks’ checklist is ending an 0-6-2 skid away from Cady Arena. And Denver has been somewhat vulernable lately, winning just two of its last six. 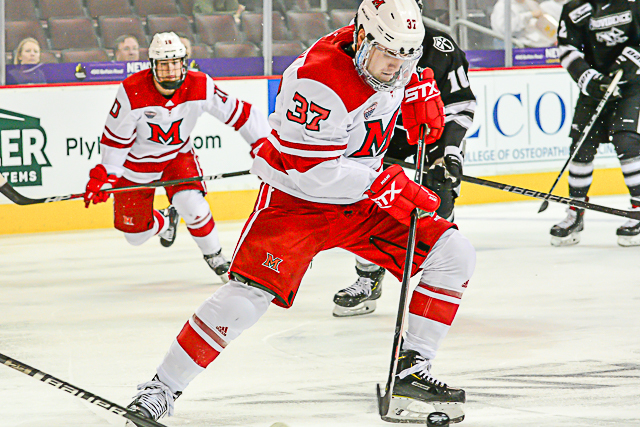 WHO: Miami RedHawks (10-16-4) at No. 7 Denver Pioneers (16-7-4). WHERE: Magness Arena (3,642), Denver, Colo. WHEN: Both games – 9:07 p.m. ALL-TIME SERIES: Denver leads, 14-11-3. TV: Saturday – Altitude Network (DirecTV Ch. 681). 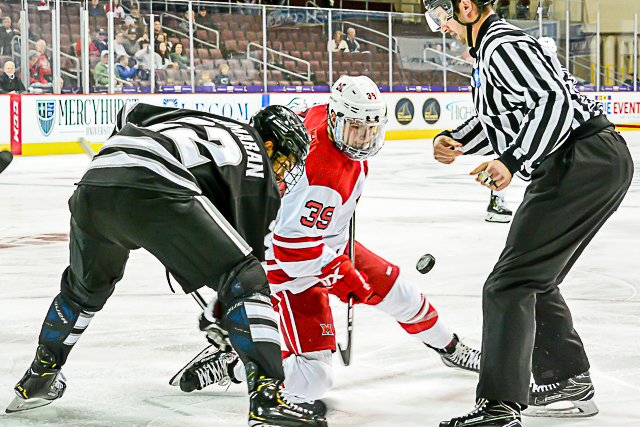 DENVER RADIO: Both nights – KKFN-FM (104.3), Denver, Colo.
NOTES: Denver has struggled to find the net recently, resulting in a 2-3-2 stretch during the meat grinder portion of its NCHC slate. 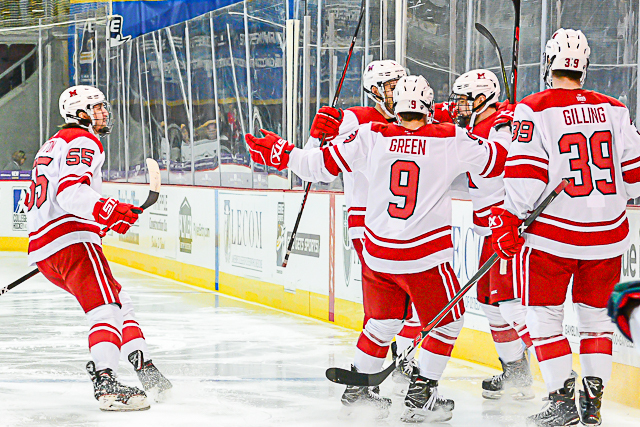 The Pioneers have been held to eight goals in their last six games after scoring at nearly a three-and-a-half goal clip the first half of the season. Liam Findlay hasn’t had any problem producing offensive for DU, as he leads the team with 27 points, including a Pioneers-best 15 assists. 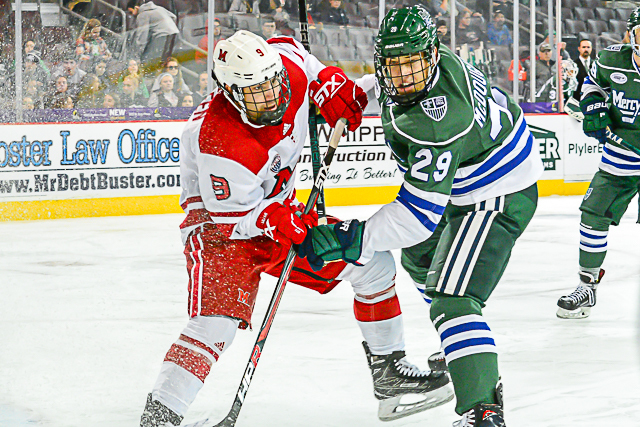 A freshman, Emilio Pettersen, is tops in assists with 17 to go along with six goals for 23 points. 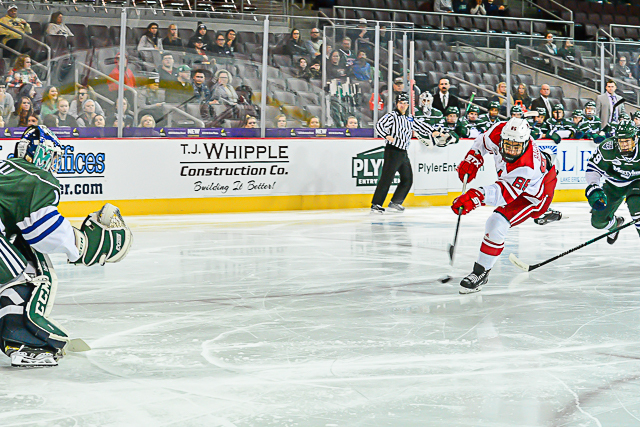 Jarid Lukosevicius and Cole Guttman are both in double-digits in goals with 13 and eight, respectively, and Brett Stapley has been another key contributor up front for the Pioneers with five goals and 12 helpers. Denver’s defense corps moves the puck well and is solid in its own end. Ian Mitchell has 13 assists as well as three goals to pace the blueliners, and Slava Demin has scored four times and chipped in nine assists. Michael Davies is also in double digits in points with 11, and senior Lester Lancaster has four tallies. 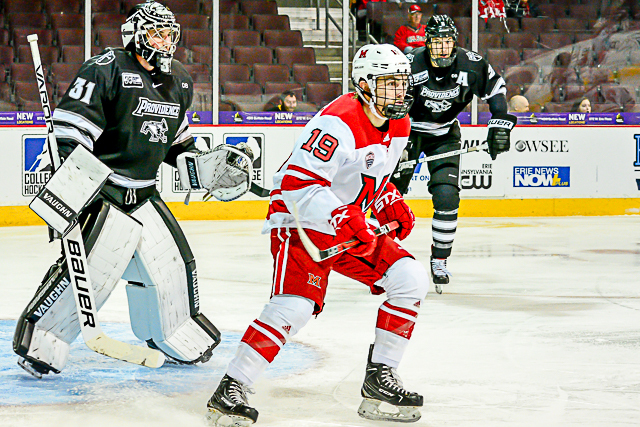 The Pioneers have battled injury problems in net this season, but Denver has still been solid in net and it appears both of its starters are finally healthy. Devin Cooley has the better overall numbers this far, with a 1.93 goals-against average and a save percentage of .934. 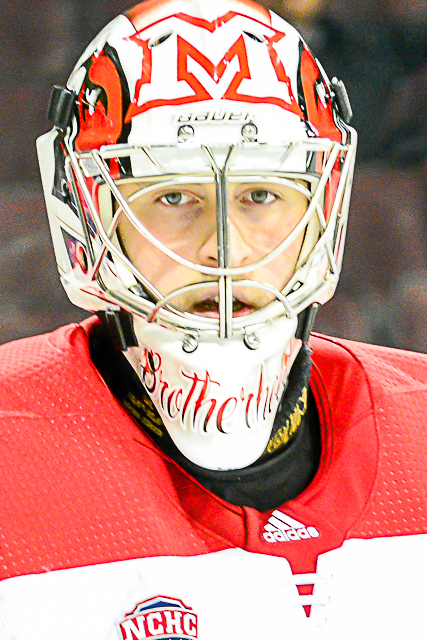 Filip Larsson’s GAA is 2.43 and his save percentage is .918. 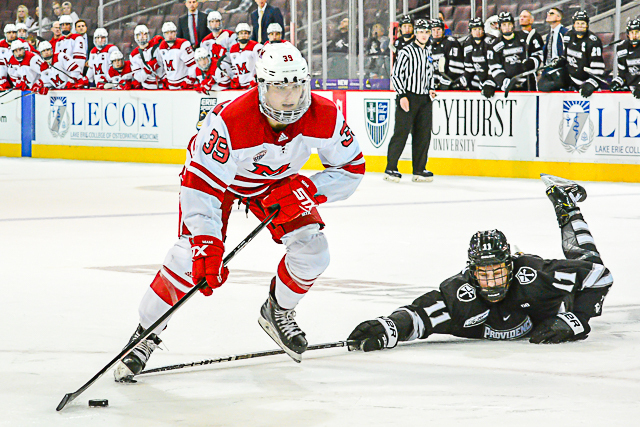 DU hasn’t been particularly impressive on special teams, with a 16.0 percent rate on the power play and a penalty kill clip of 80.4. 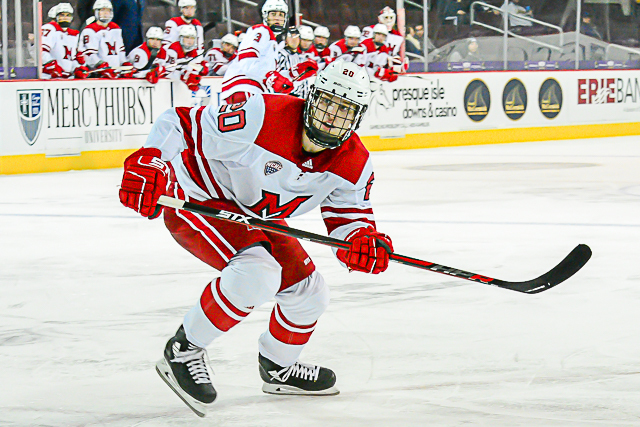 But the Pioneers are disciplined, as opponents have just 103 man-advantage opportunities in 2018-19. Miami has matchup well against Denver in recent years, earning a tie and a win vs. the Pioneers last season and tying them twice in Magness Arena when DU was No. 1 in early 2016-17. 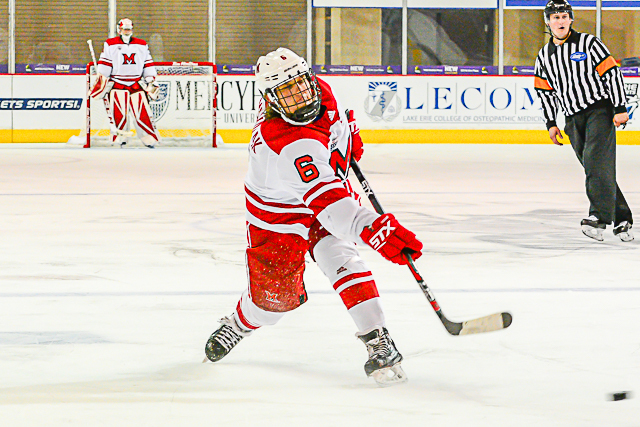 Recently, the RedHawks have struggled to score and prevent opponents from doing so. They have scored two goals or fewer in eight of their last nine games, including three shutouts, and in 11 of 12 contests Miami has surrendered at least three markers. 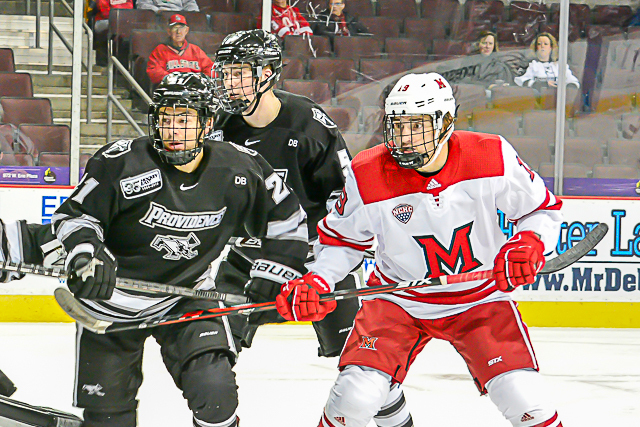 The two hottest teams in college hockey are Providence and Western Michigan. 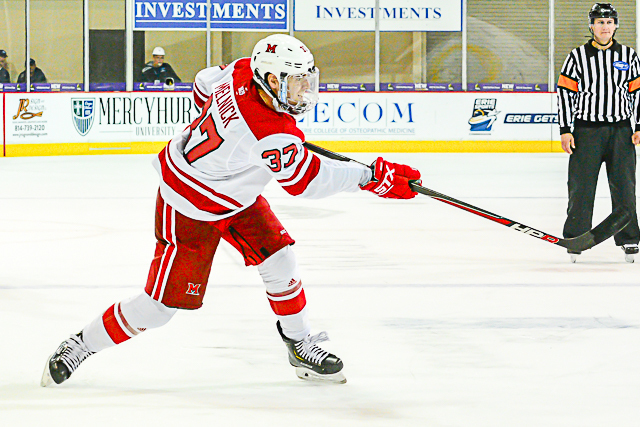 Miami played PC last week, and this weekend the RedHawks face the Broncos. WMU, riding an eight-game unbeaten streak that includes a 3-0-1 record vs. North Dakota and Minnesota-Duluth, has vaulted into second place in the NCHC. However, the Broncos are only two points ahead of Miami, which is tied for fourth. 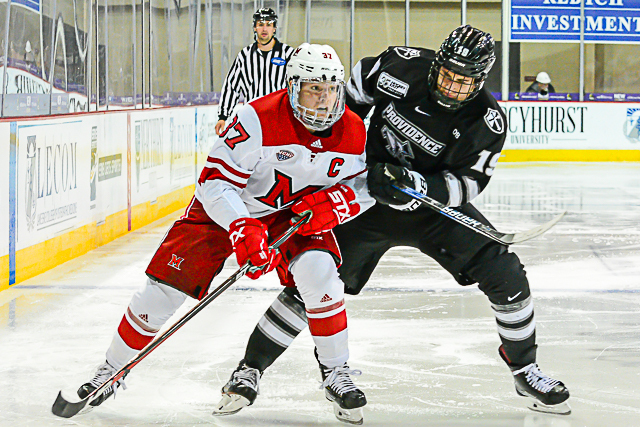 These teams meet again in Oxford to wrap up the regular season on March 8-9, so WMU will have a major hand in determining where the RedHawks finish in the conference standings. WHO: No. 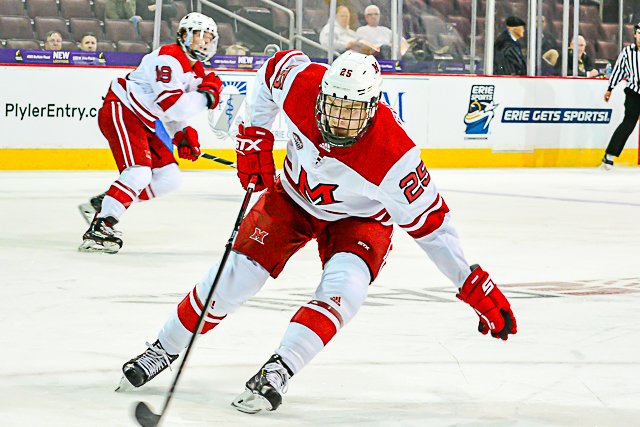 20 Miami RedHawks (9-7-4) at No. 14 Western Michigan Broncos (11-6-1). WHERE: Lawson Arena (3,667), Kalamazoo, Mich. WHEN: Friday – 7:05 p.m.; Saturday – 7:05 p.m.
WESTERN MICHIGAN RADIO: WZOX-FM (96.5), Kalamazoo, Mich.
TV: Friday – CBS College Sports. 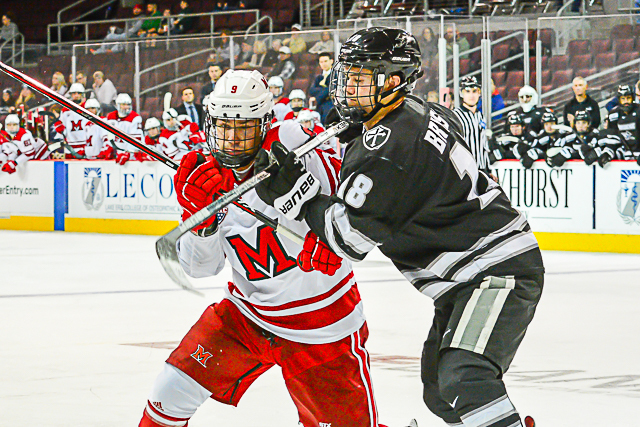 NOTES: Over the past three seasons, Western Michigan has taken major strides offensively, an area in which the Broncos had previously struggled since the formation of the NCHC. WMU has scored 67 times in 18 games for a 3.72-goal clip, the sixth-best rate in Division I.
Josh Passolt has been a breakout sophomore season for the Broncos, leading the team in goals (11) and plus-minus (plus-15) and is tied for the WMU points lead with 19. Four of his markers have been game winners. Colton Conrad is tied with Passolt atop the team points leaderboard, as Conrad is pacing Western Michigan in assists with 13. 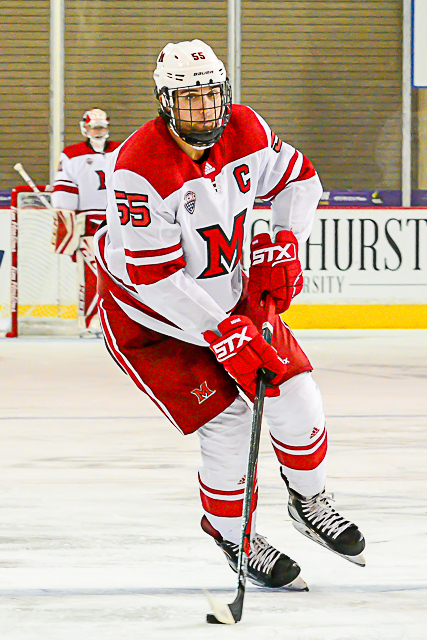 He is also exceptional in the faceoff circle, having won 57.0 percent of his draws this season. 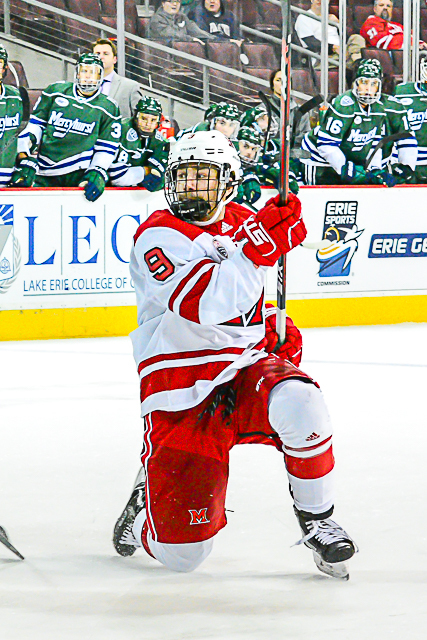 Like Passolt, Hugh McGing has also enjoying a statistical blow-up with 10 goals, including five on the power play. He has 18 points and 35 penalty minutes. 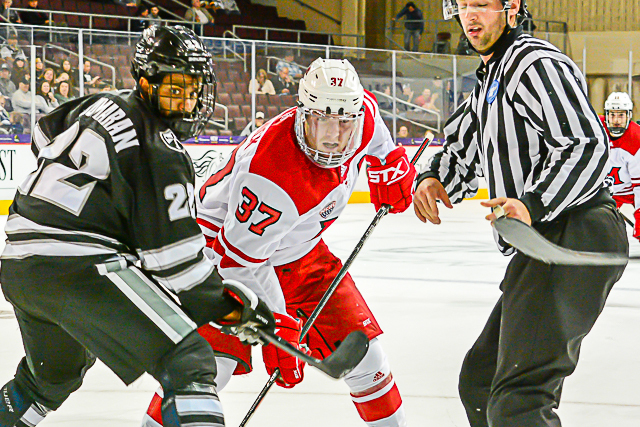 Ethen Frank has already eclipsed his rookie season goal mark, posting eight this season after notching seven freshman year, and Austin Rueschoff is another significant offensive threat with six goals and eight helpers. Philadelphia Flyers second-round pick Wade Allison, one of the NCAA’s scoring leaders last season before he tore his ACL, is back on the ice for Western Michigan and could bolster its offense even more. Allison has played eight games and is 2-2-4 after posting a 15-15-30 line in just 22 games in 2017-18. Other regulars up front for WMU are Dawson DiPietro, Cole Gallant, Drew Worrad, Paul Washe, Jaden McMullen and Lawton Courtnall – son of former NHLer Russ Courtnall. Cam Lee leads Broncos blueliners in goals (5), assists (10) and points (15) while notching a plus-10 rating. 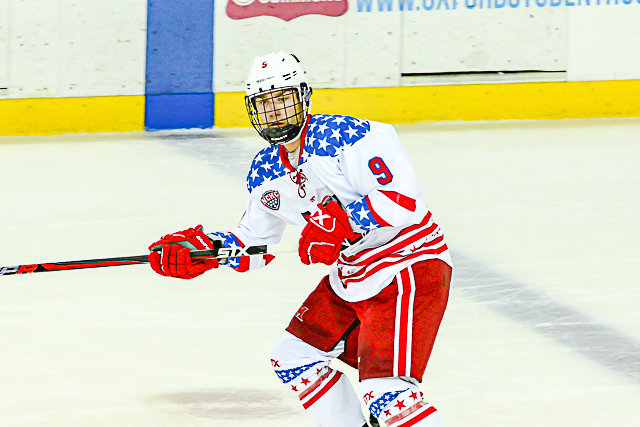 Defenseman Corey Schueneman has recorded eight assists and nine points, and Buffalo Sabres second-rounder and Team USA product Matthias Samuelsson, who just returned from winning silver in the World Juniors, has scored three times and picked up five helpers. 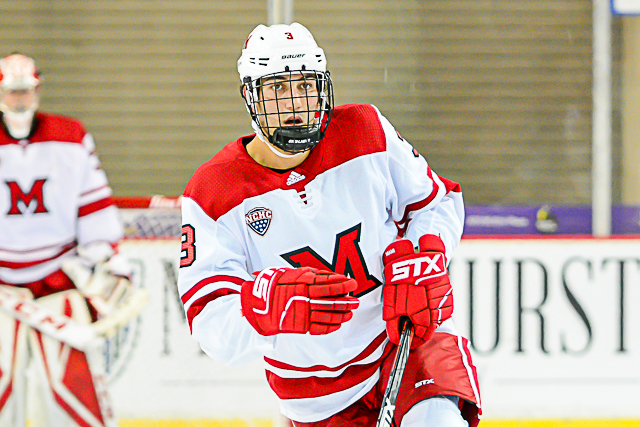 Luke Bafia, Kale Bennett and Jared Kucharek are the other key cogs of WMU’s back end, and Michael Joyaux – younger brother of former RedHawks Chris and Matt Joyaux – has dressed for 10 games. During their current eight-game unbeaten streak, the Broncos have allowed just 12 goals, and they have held their last three opponents to one goal apiece. Goaltender Trevor Gorsuch is having a stellar senior season, going 9-2-1 with a 1.95 goals-against average and a .932 save percentage. He had six career wins and was sub-.900 entering this year. Ben Blacker, who was dominant his freshman season, took a step back in 2017-18 and has made just two starts this year, posting just an .870 save percentage. He’s actually third on the team in goaltender minutes played behind Austin Cain. 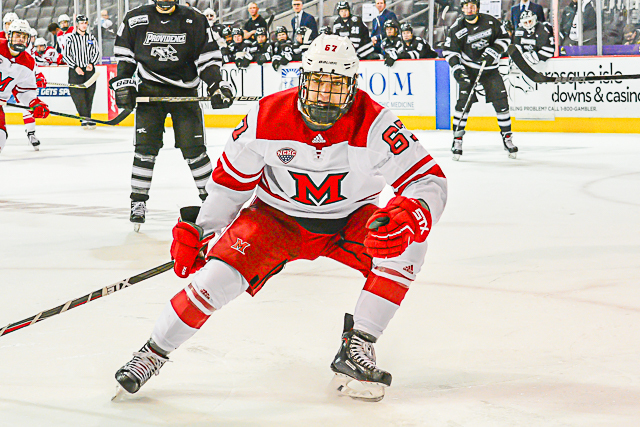 Miami has started games slowly at times this season, and if that happens this weekend Western Michigan will make the RedHawks pay. 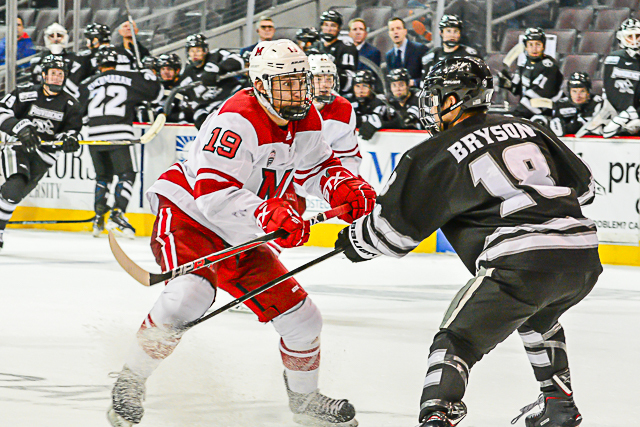 The Broncos are tops in the NCHC in first-period goals with 27 – that’s 1.50 per game. WMU has been best at even strength, as just 14 of its goals have come on the power play and another pair shorthanded. The RedHawks are winless in their last six – they actually haven’t won since Nov. 17 – but they have four ties in that span, including one at now-No. 7 Providence and two at home against No. 1 St. Cloud State. 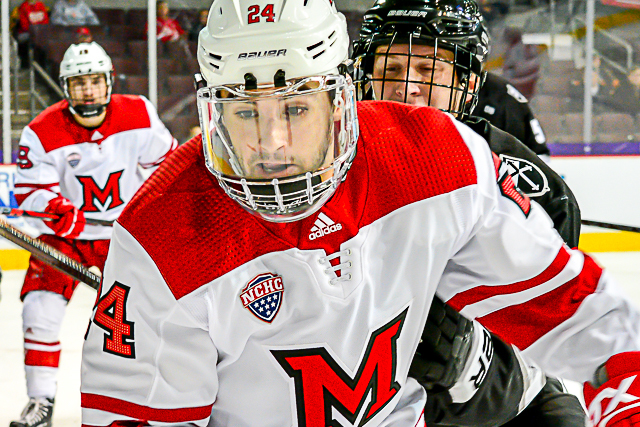 Miami’s Josh Melnick is riding a seven-game point streak, with three goals and five assists in that span, and Ryan Siroky has four points in his last three contests. 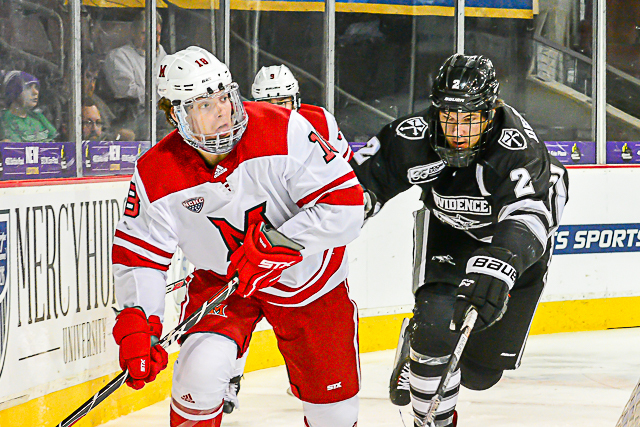 The RedHawks are 16th in college hockey in defense, giving up 2.30 goals per game. 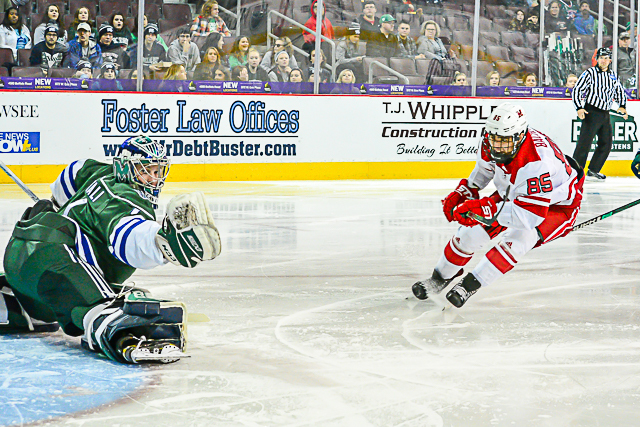 Goalie Ryan Larkin is seventh in D-I save percentage at .931 and is tied for sixth in shutouts with three. With 142 meetings, Miami has played Western Michigan more than any other foe except Ohio State and is 68-63-11 vs. the Broncos, but WMU holds a 35-25-7 edge in Kalamazoo. 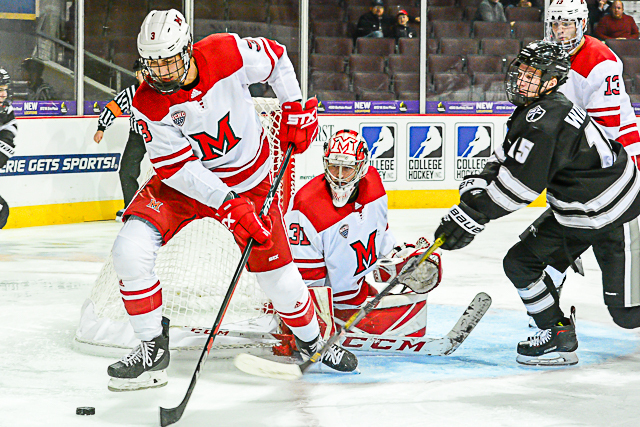 The RedHawks have played OSU 151 times, and with that series currently dormant, Western Michigan will soon move into first place on MU’s most-played opponents list. The Broncos have always played well at home and are 6-2-1 at Lawson Arena this season. 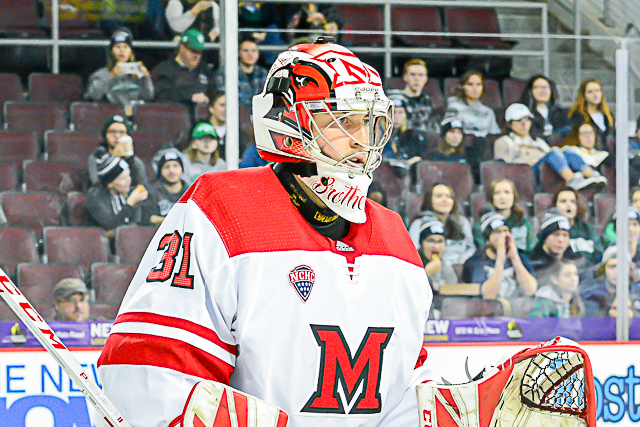 A major penalty was a key reason Miami’s four-game winning streak ended on Saturday. The No. 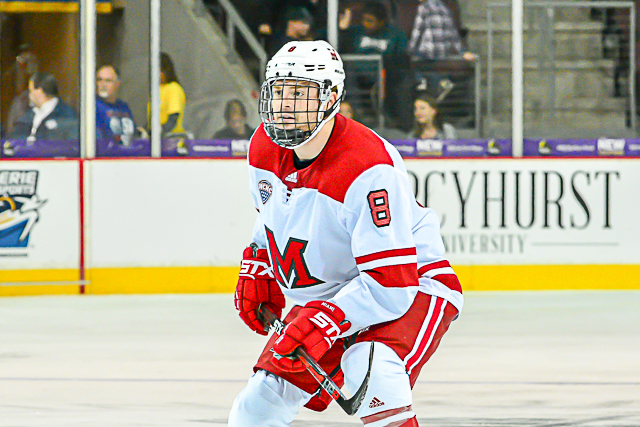 20 RedHawks led by two goals early but lost, 6-3 to Nebraska-Omaha in the series finale at Baxter Arena, partly due to three power play goals scored during a Mavericks five-minute man advantage. 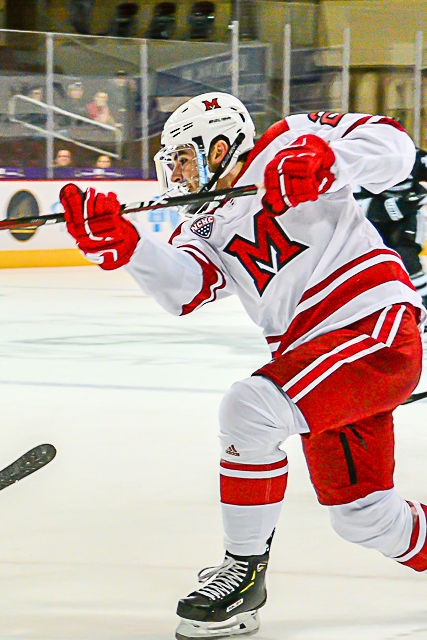 Miami went up, 2-0 in the first period but allowed a Mavericks goal with 61 seconds left in the opening frame. 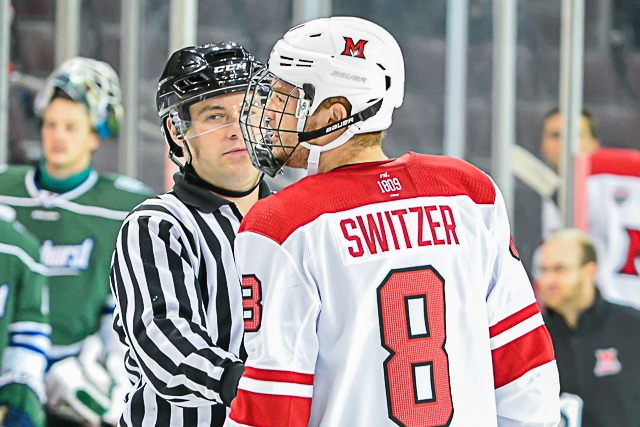 RedHawks captain Josh Melnick was given a major and game misconduct for spearing midway through the second period and UNO scored three times on the ensuing power play to give the team a lead which it would not relinquish. 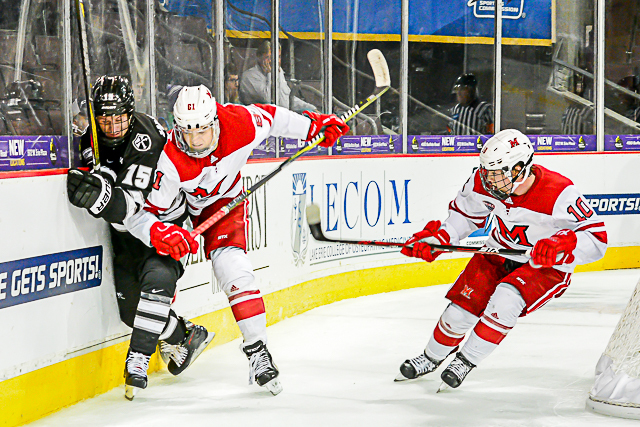 It was the first win of the season for the Mavericks and the most goals against for the RedHawks in 2018-19. 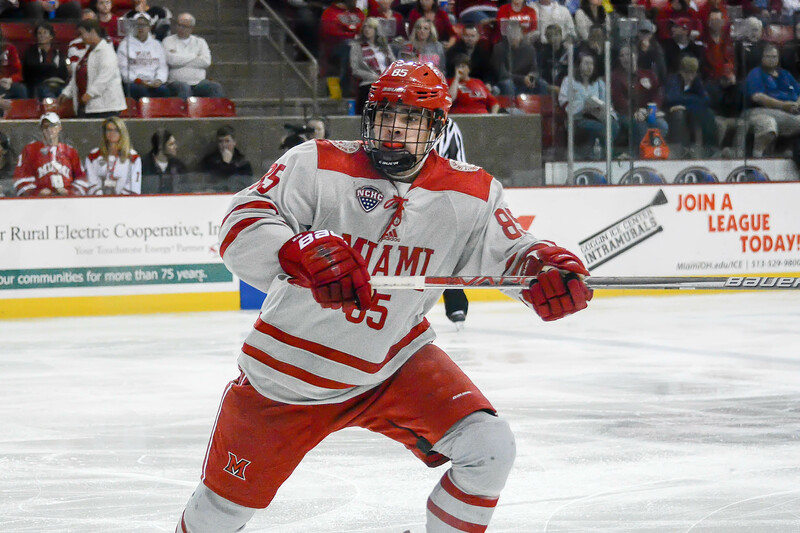 RECAP: Miami (7-3) took the lead on a 5-on-3 when Melnick slid a lateral pass across the top of the faceoff circles, and Grant Hutton one-timed a rip past goalie Evan Weninger. With one UNO (1-6-1) skater back, Hutton had a shot blocked, but the puck trickled to Phil Knies in the right faceoff circle, and he whipped one just under the crossbar to make it 2-0 a minute later. But Taylor Ward batted home a bad-angle shot off a rebound from a point-blank Mason Morelli chance with 61 seconds left in the opening frame. 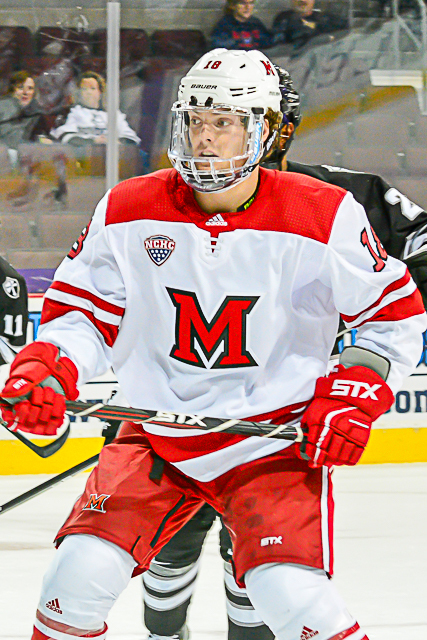 Melnick’s penalty put Miami down two men, and UNO’s Fredrik Olofsson roofed one from the right faceoff dot to tie it. Kevin Conley scored from nearly the same spot on a partly-deflected pass 96 seconds later, giving the Mavericks their first lead of the weekend, 3-2. Another 1:57 passed before Chayse Primeau one-timed a backdoor pass from Conley at the side of the cage, giving UNO a two-goal lead. 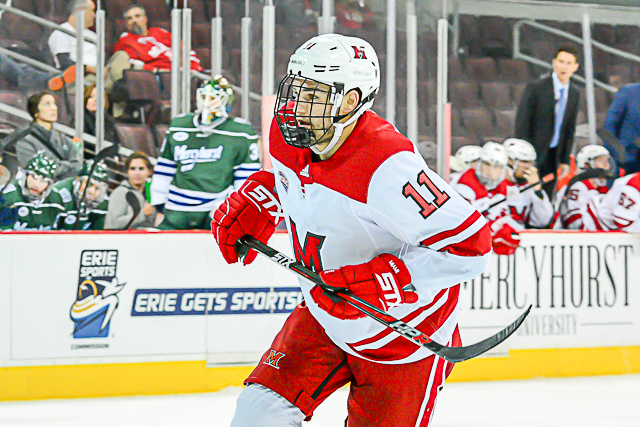 Miami cut its deficit to one when Gordie Green knocked home a long rebound from the inside edge of the faceoff circle less than two minutes into the final stanza. But UNO’s Tristan Keck extended his team’s lead to two late in the third period, and Morelli netted his second of the night when he poked home a centering feed from behind the net. STATS: Green scored for the fourth straight game and extended his points streak to five games. He has five goals and five assists during his hot streak. — Melnick has a four-game points streak (2-6-8), and Hutton and Jonathan Gruden both picked up points for the third straight contest. — After a slow start on the power play, Miami has scored on the man advantage five straight games, going 6-for-19 in that span. THOUGHTS: The elephant on the ice in this game is the Melnick penalty. The ensuing power play was obviously critical. 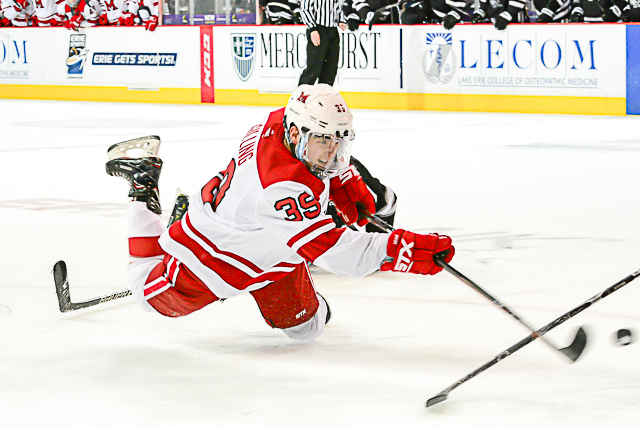 — It appears Melnick rammed his stick between the legs of an UNO skater after the two battled for the puck along the boards for an extended time. — The case could be made that said skater interfered with Melnick as he attempted to vacate the area. 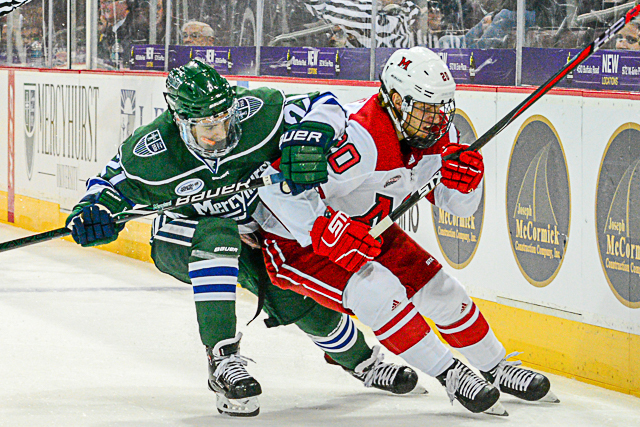 — The NCAA is tightening up in certain areas, and while I’ve certainly witnessed way worse hits in recent years that have not been called, college hockey is now replaying nefarious incidents and is obviously not afraid to dish out majors. — All that said, a minor was certainly warranted. Considering what we’ve seen called majors the first four weekends, it’s not out of line that Melnick received a major. The upgrade was extremely costly to Miami, as the Mavericks scored twice in the final three power play minutes that wouldn’t have happened had the call been a minor. Those three goals flipped a 2-1 Miami lead to a 4-2 UNO advantage. 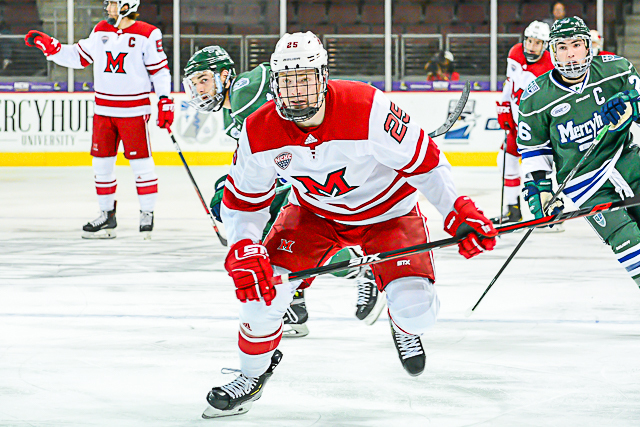 — The Mavericks had already tilted the ice in their direction heading into their scoring barrage, having trimmed the RedHawks’ lead to one after Miami jumped out to a 2-0 lead, and the penalty provided UNO the fuel to seize control of the game. LINEUP CHANGES: Forwards Zach LaValle and Carter Johnson did not dress. 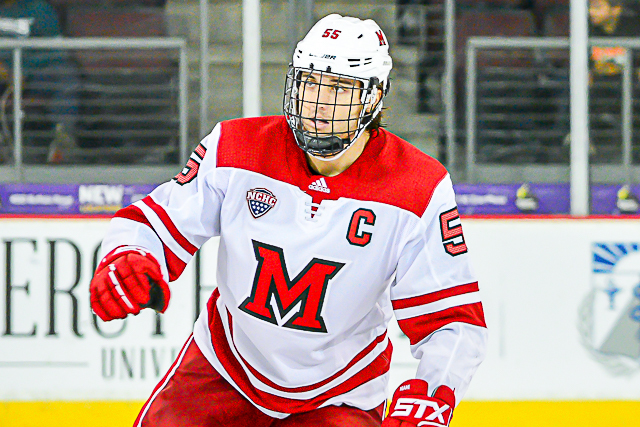 Christian Mohs and defenseman Andrew Sinard did, giving Miami seven defensemen. 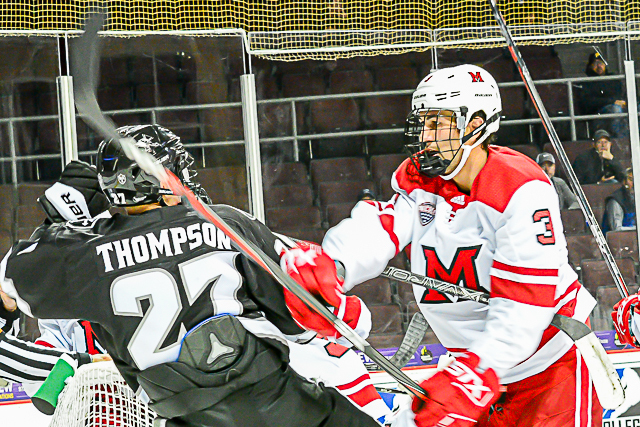 FINAL THOUGHTS: This is the first disappointing loss of the season, not because UNO was winless but because Miami had the lead and let it get away. To be fair, Nebraska-Omaha is definitely better than the 0-6-1 record it sported entering this contest, but good teams rarely lose when they take two-goal leads. The series ends in a split and Miami finishes its first 10 games with a 7-3 record, and not to put words in anyone’s mouth but I’m guessing under the off-season circumstances the coaching staff is happy with a .700 winning percentage through the first weekend in November. 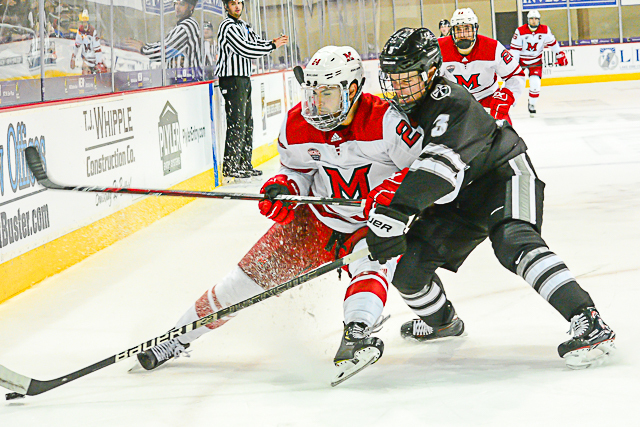 But the schedule gets a lot tougher the rest of the way, and the RedHawks can ill afford to have discipline lapses turn would-be wins into losses. Miami’s ninth game of the season was its first true road contest, but the No. 20 RedHawks kept up their MO of winning by wide margins. 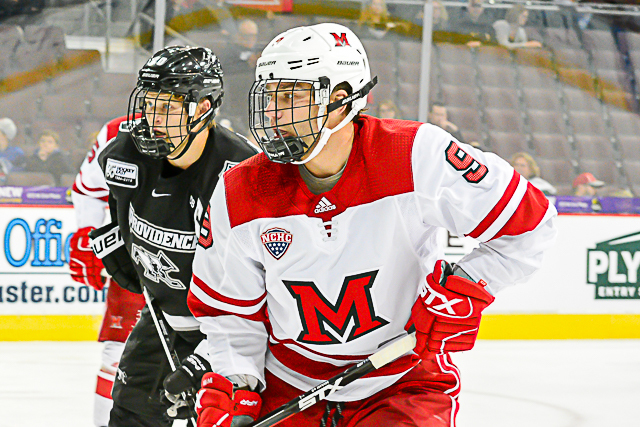 Gordie Green found the net twice as MU scored the final three goals in a 4-1 win vs. Nebraska-Omaha at Baxter Arena on Friday, extending its winning streak to four games. 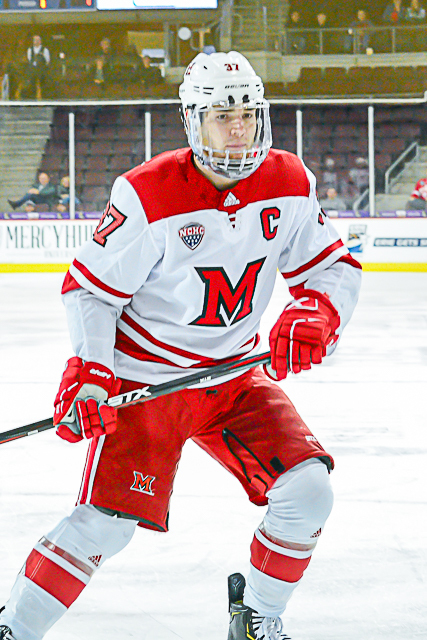 This was also the NCHC opener for the RedHawks (7-2), who played six of their first eight games this season in Oxford and the other two in Erie, Pa., in the Ice Breaker Tournament. 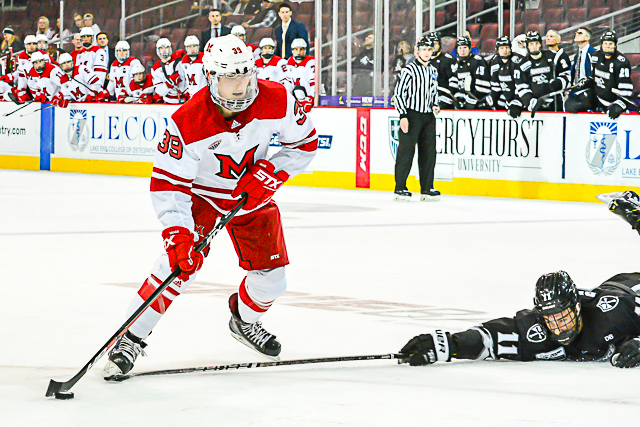 During their recent hot spell, the RedHawks have surrendered just three goals and none in the third period. Forward Jonathan Gruden (photo by Cathy Lachmann/BoB). 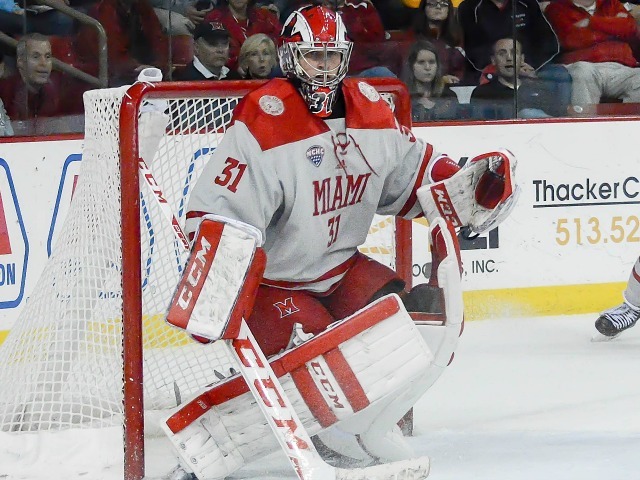 Miami goalie Ryan Larkin won his fifth straight game, stopping 19 of 20. 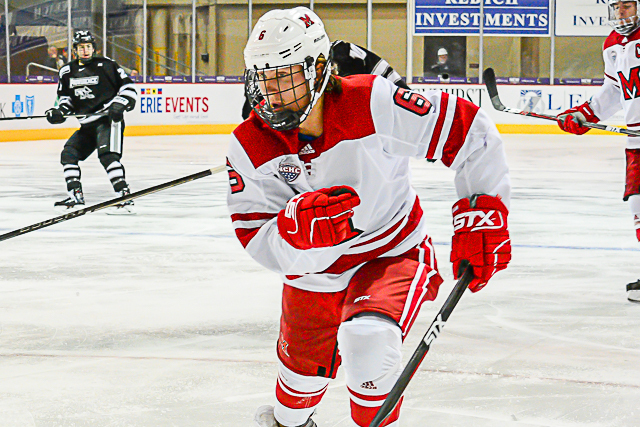 RECAP: Jonathan Gruden scored his first career goal when he skated behind the UNO net and shot it off the back of goalie Evan Weninger on the power play just 79 seconds into the game. 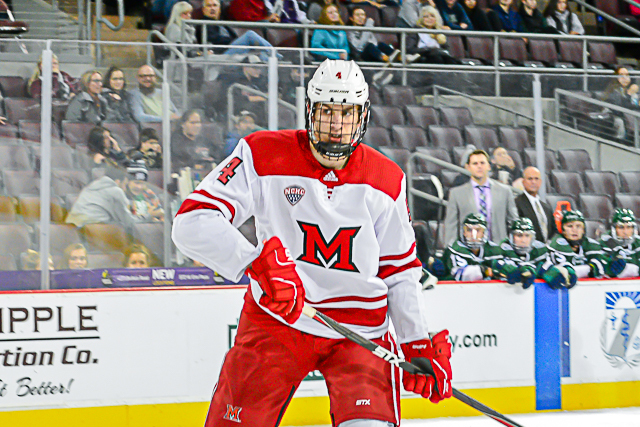 Miami regained the lead 66 seconds later on a blue line blast by Grant Hutton that was deflected in by Brian Hawkinson for his first career goal. 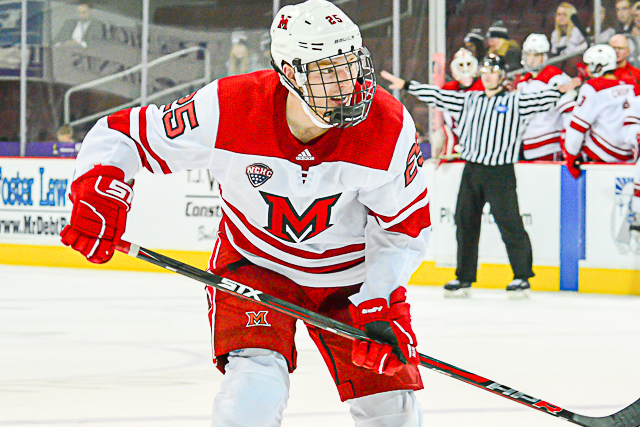 With 5:27 left in the middle stanza, Gordie Green jarred the puck from an UNO defender in the Miami zone, and Scott Corbett seized it and fired a shot off the crossbar. The puck skipped through the top of the crease and Green batted it out of the air as it dribbled into the back of the cage. 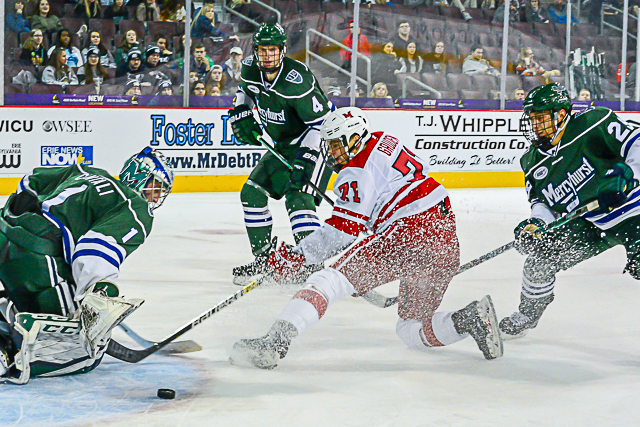 Green picked up his second marker of the night with an emphatic rip into the empty net from the outside edge of the faceoff circle with 22 seconds to play after controlling a Josh Melnick two-line outlet pass. 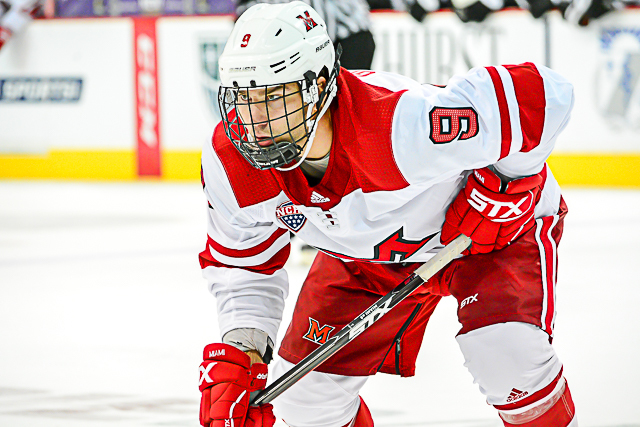 STATS: The Green-Melnick combo on Miami’s top line continues to dominate, as Green extended his multi-point game streak to four and Melnick picked up multiple points for the third consecutive contest. Green has scored in three straight games and is 4-5-9 during his points streak. Melnick has scored twice and earned five assists in his last three. 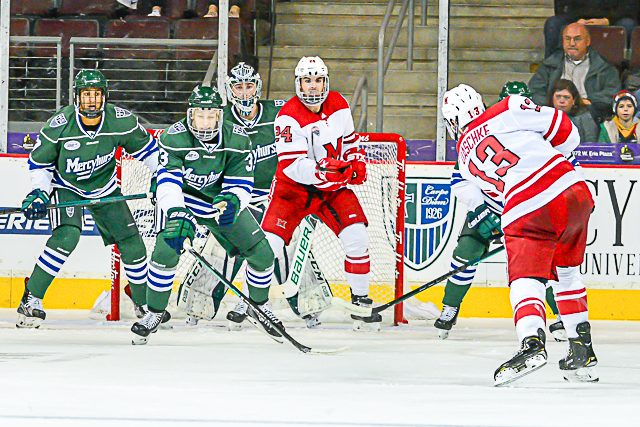 — Hawkinson also has points in three straight, including his first career goal in this one. — Larkin has allowed just three goals during his five-game win streak and has stopped 123 of 126 shots in that span (.976). 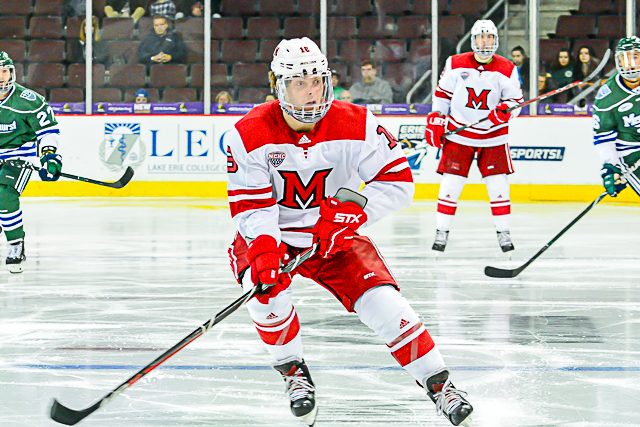 — This was the fourth straight game in which Miami did not allow a third-period goal, and the RedHawks have given up just three in nine contests this season. In 2017-18 they surrendered 46 tallies in 37 games after the second intermission, including a pair in overtime. 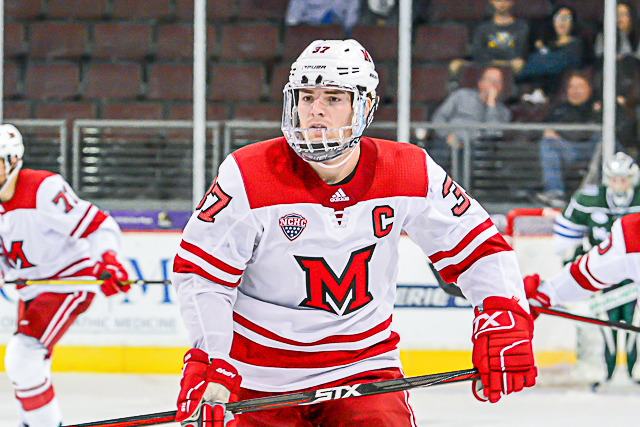 THOUGHTS: Miami, once again, played a full 60 minutes against a team they were supposed to beat, and the RedHawks won for the seventh time, with six of those wins coming by three or more goals. In other words, they’re beating teams they should beat and doing so in decisive fashion. This was both the first true road game and the inaugural league contest for Miami, which passed both tests with high grades. And UNO may be winless but it is not a bad team, or at least the Mavericks didn’t play that poorly. Their shot total of 20 is somewhat deceiving because they generated a lot of chances. A road win in this league, regardless of the opponent’s status, is a major accomplishment, and in this game Miami pulled out the victory on hostile ice and looked good doing so. — Great job answering the tying UNO goal late in the first period goal by regaining the lead before intermission. 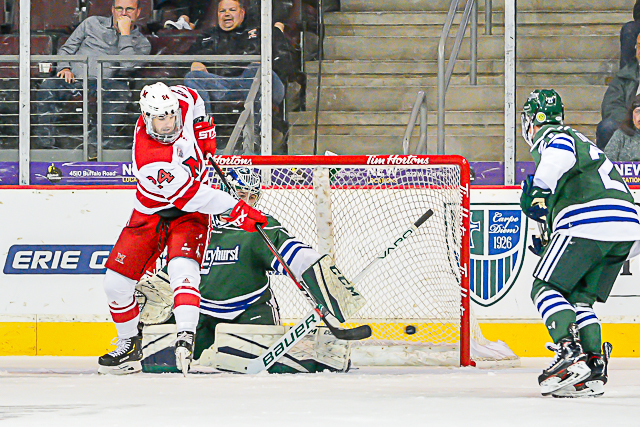 That was the Hawkinson deflection on the Hutton blast and eventual game winner. — Can’t say enough about how well Green is playing. He has nine points in four games and his defense is as good as his offense. He made his first goal happen with his forechecking, as he knocked the puck loose and scored on the rebound from Corbett’s ensuing shot. — I’d been to all of the first eight games and this was the first one I’d seen on TV, but Derek Daschke looked even better on the tube than live. Twice a last-second desperation play prevented a slam-dunk goal, and he picked up two assists, giving him five points in his last four. Daschke was probably even more amped to play against the school he was formerly committed to. Mentioned this last weekend but he continues to better every game. — Prior to this game, only four Miami forwards had played every game but had not scored, and Hawkinson and Gruden both took their names off that list. 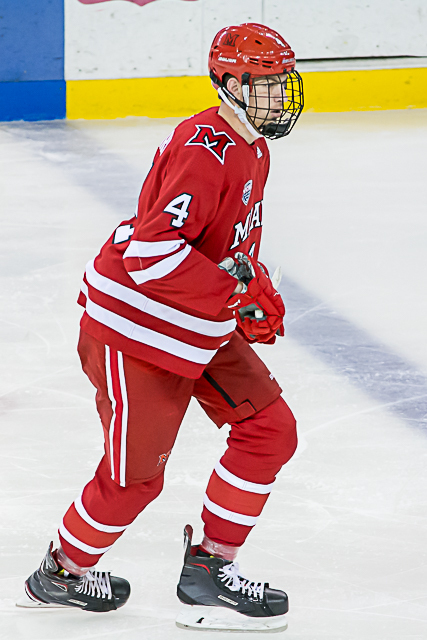 Gruden had been snakebitten, as the Ottawa Senators’ fourth rounder was expected to contribute right away. 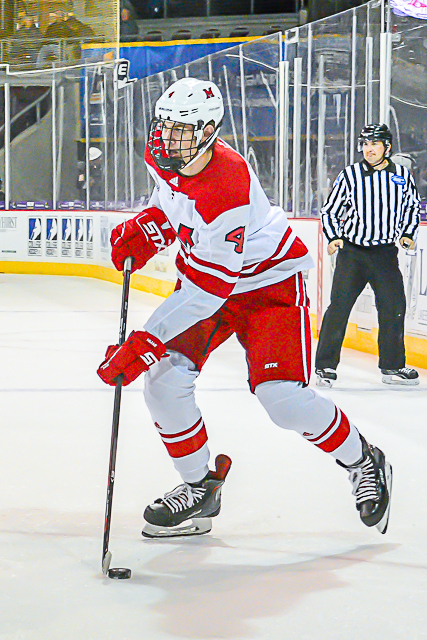 Yet Hawkinson played three full USHL seasons – 164 games – and only scored 10 times with just 16 assists. 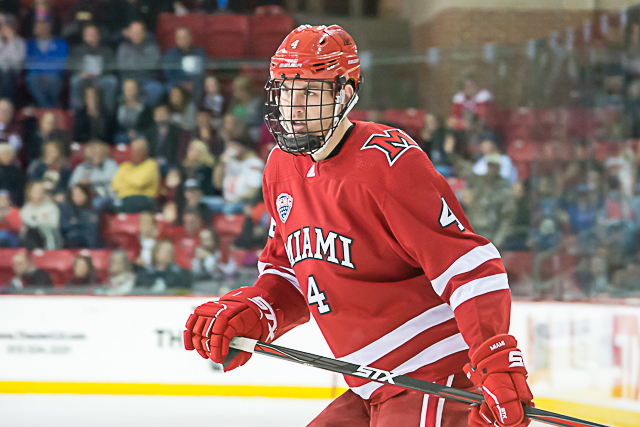 Despite his lack of scoring in juniors Hawkinson has a 1-5-6 line in nine games with Miami. 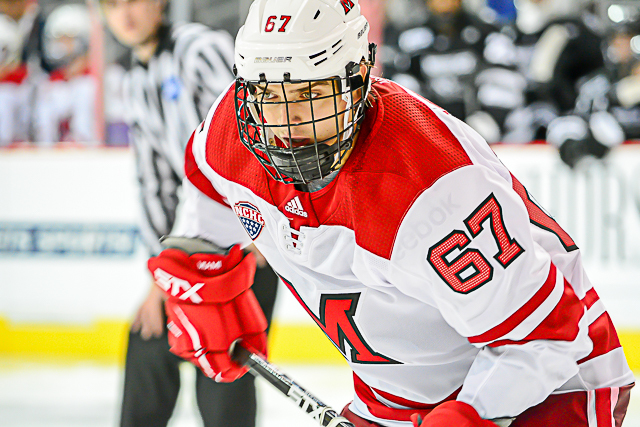 Gruden has tons of raw talent and it should be fun to watch him develop, and Hawkinson has taken complete advantage of his opportunity in Miami’s lineup and has already become a regular on the penalty kill. 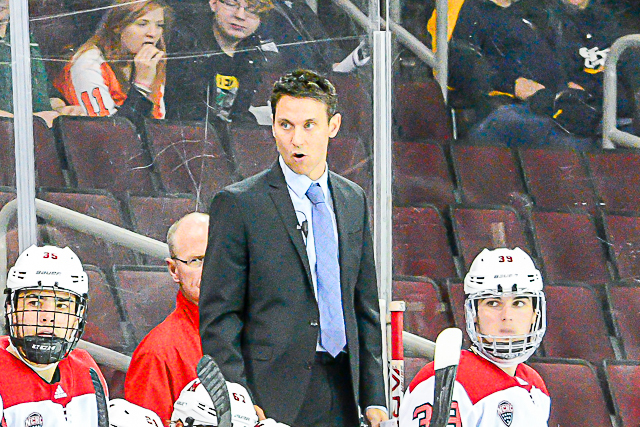 — Karch Bachman hit a post early and then a crossbar-and-post later in the game. He had three goals in the first four games this season and continues to get better in other aspects. He is scoreless in five straight but has been pretty unlucky recently and it feels like he’s going to break out again soon. — This game was broadcast nationally on one of the regional Fox Sports Channels, and UNO announcers Dave Ahlers and David Brisson did a fabulous job. Both are very fair in their announcing – regularly complimenting Miami players for their play – and extremely knowledgeable. Ahlers is a former AHL announcer and Brisson played briefly in the pros after graduating from UNO. FORWARDS: A-. A well-played game by this entire corps, up and down the lines. Green was the standout with Melnick not far behind. Gruden still makes too many high-risk passes but hopefully this goal will vault his game another level. Rourke Russell (photo by Cathy Lachmann/BoB). DEFENSEMEN: B+. Especially liked Daschke’s play although he did turn one over for a near-goal. Rourke Russell also stood out, and watching from a higher vantagepoint it was easier to appreciate his geometrical smarts in his usage of the boards on defensive-zone passes. GOALTENDING: A. The goal against was on a magnificent passing play that was basically a 2-on-oh at the top of the crease. Larkin is a key reason for Miami’s hot start and his rebound control is as good as it’s ever been since he came to Oxford. LINEUP CHANGES: Only one: Up front, Carter Johnson was back in the lineup after sitting last Saturday. He has now played three straight series openers but has sat in consecutive finales. 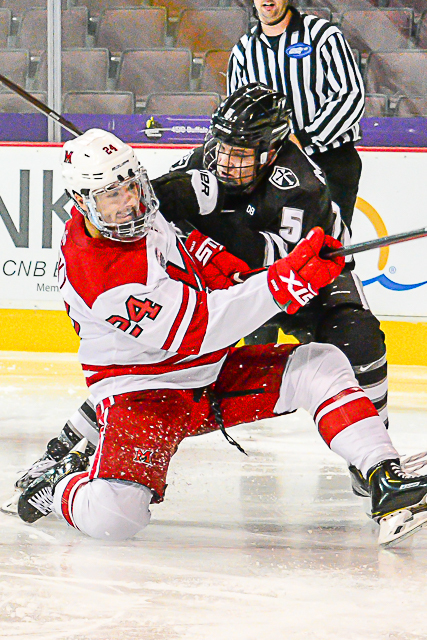 He replaced Andrew Sinard, who was the seventh defenseman in Game 2 vs. Colgate last weekend. FINAL THOUGHTS: Winless or not, UNO played pretty well and Miami was better. 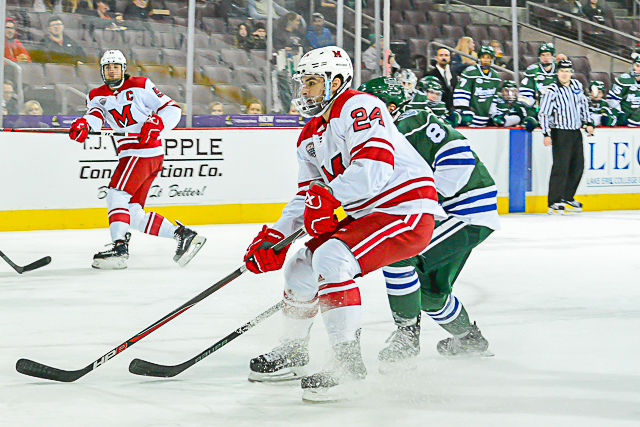 The Mavericks hurt themselves with undisciplined penalties early and the RedHawks took advantage with a power play goal. Omaha is obviously in a down year but this was still a quality win for Miami. 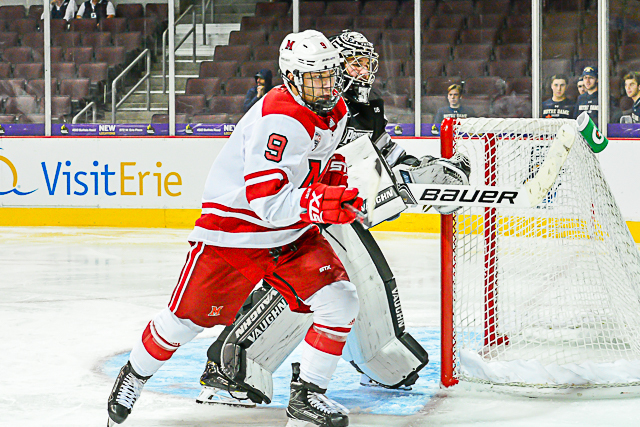 Images from Miami’s games in the Ice Breaker Tournament played at the Erie Insurance Arena in Erie, Pa., on Oct. 12-13, 2018. All photos by Cathy Lachmann/BoB. 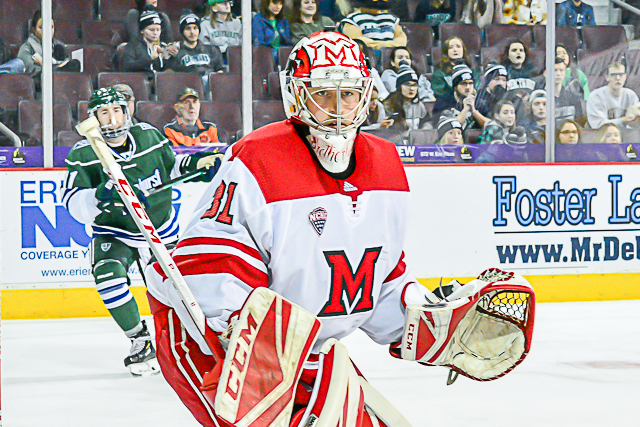 OXFORD, Ohio – It started off shaky but ended up a successful start in net for Jordan Uhelski. 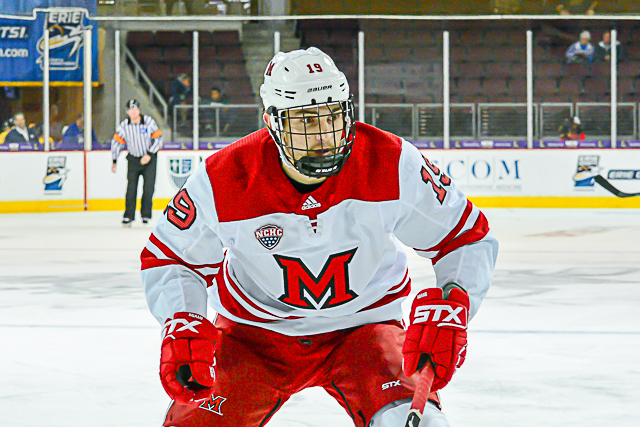 The senior stopped 17 shots to earn the win in his Miami debut, a 5-1 victory over Alabama-Huntsville at Cady Arena on Saturday. The fact Uhelski earned his undergraduate degree at UAH had to make the outcome that much sweeter. He is working on his Master’s degree and had one year of eligibility remaining, which is why he was able to join the RedHawks without sitting out a season. 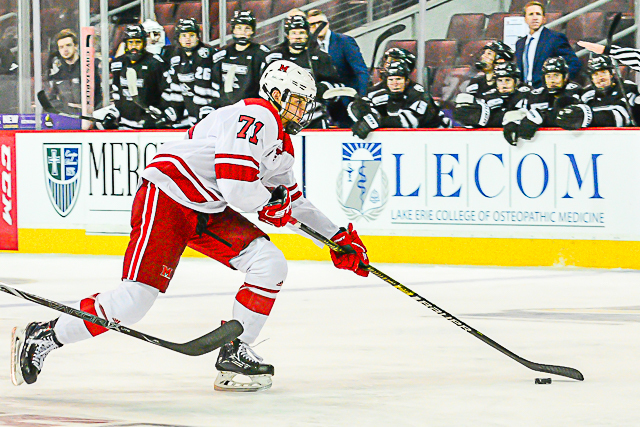 RECAP: Miami junior Carter Johnson drove the net and went top shelf to open the scoring 4:48 into the first period. But exactly one minute later, an outside shot by the Chargers’ Austin Beaulieu beat Uhelski on the stick side on the team’s first shot of the game, tying the score. 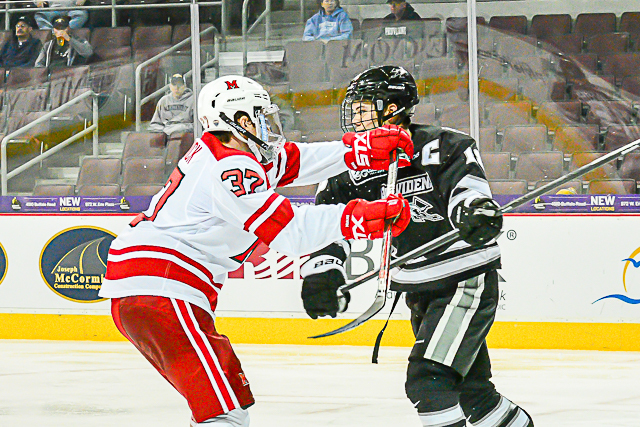 The RedHawks (1-0) answered 42 seconds after that marker, as Karch Bachman skated across the top of the crease and tucked one past sprawled out goalie Mark Sinclair. Early in the second period, Johnson was driving the when UAH’s Kurt Gosselin delivered a head shot and was assessed a major penalty and game misconduct. Johnson eventually skated off under his own power but did not return. Miami made the Chargers (0-1) pay on the power play, as Gordie Green slammed home a rebound off a Bachman shot with 15:18 left in the middle stanza. 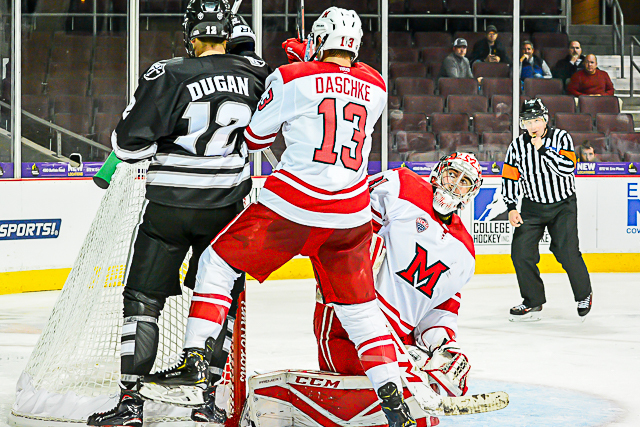 The RedHawks made it 4-1 with 9:46 remaining in regulation as a Derek Daschke one-timer found the corner of the net off a feed by Green. Miami capped off the scoring with 2:17 to play when Jonathan Gruden centered a pass from the side of the net to a wide open Grant Hutton in the slot, and Hutton buried it. STATS: After allowing a goal on the first shot he faced, Uhelski stopped the next 17. 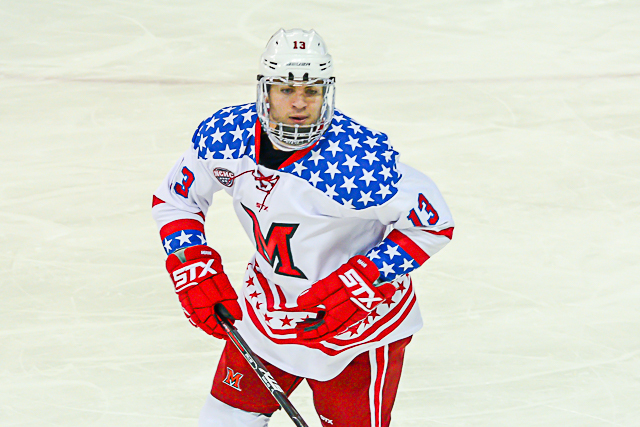 Hutton, Green, Bachman and Daschke all finished with two points on a goal and an assist apiece as 11 different RedHawks recorded at least one point. 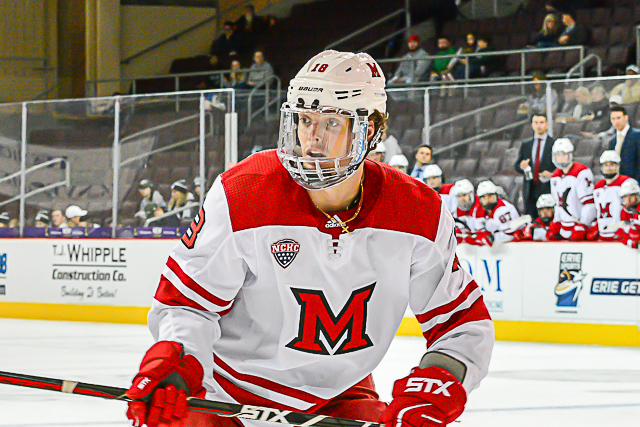 Those were the first career points for Daschke, and Gruden, Brian Hawkinson and River Rymsha also picked up their inaugural Miami points, all on helpers. THOUGHTS: One game is obviously a very small sample size, but there was an energy at the rink that had been recently lacking. The attendance was 2,702 on a day when it was 90 degrees and the football team played at Akron in the afternoon. ‘Reenergize’ is a term Coach Enrico Blasi said the team is using a lot these days. That was an apt description of the Cady atmosphere as well, which is a welcome improvement. — There was a lot to like among the newcomers. After allowing a soft goal early, Uhelski settled in nicely and made a pair of high-quality saves, including one on a semi-breakaway. Gruden’s pass to Hutton for the final goal was pretty sweet, Hawkinson played with a lot of grit, Rymsha dished out a couple of solid hits and for 6-feet-6, Brayden Crowder seems pretty cool handling and moving the puck. We’re delve more into the newcomers after Sunday’s game. – Gosselin’s hit on Johnson was everything that hockey is trying to get away and warrants a suspension. He was issued a game misconduct and not a disqualification, which would’ve carried an automatic suspension and is disappointing. He had Johnson lined up and had ample time to target somewhere other than the head but did so anyway. And Johnson has been a fantastic story, as his game surged the second half of last season and he scored in this game before getting hurt. Now who knows when he’ll get back on the ice? Let’s keep in mind too: Gosselin is UAH’s captain. I always rooted for the Chargers when they wasn’t playing Miami, but it’ll be a little harder to do so now. – On Tuesday, coach Enrico Blasi said Ryan Larkin was the starter, but he was in a suit on Saturday. He had no obvious sign of injury, so hopefully this is just a one-game thing that happens frequently the first game of a season. — One thing about Coach Enrico Blasi: He’s totally unafraid of using freshmen in high-leverage spots, even in their first games. At one point three rookies manned the penalty kill. — We saw a lot of line combinations, partly because of Johnson’s early injury. Definitely a feeling out process for all of the skaters, which is not unexpected considering the number of newcomers. — Miami resisted the urge to pound Charger tail after the major on Johnson, and that resulted in a power play goal. It would’ve been tough to find fault with the RedHawks if they had gone after Gosselin though. FORWARDS: B+. Liked Bachman in this one and Johnson stood out until his injury. Both scored early goals. Green scored as well and was his typical solid self. 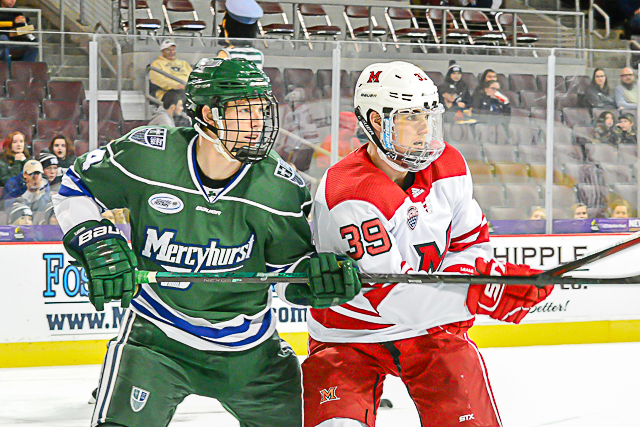 Faceoff stats were excellent: Monte Graham finished 11-5 and Josh Melnick went 9-6 to lead this corps. DEFENSEMEN: A-. Helped hold UAH to 17 shots while combining for 16 themselves. Very few Grade-A chances against. Hutton and Daschke both went 1-1-2 and Alec Mahalak and Rymsha both earned assists. GOALTENDING: B. Definitely could’ve used a mulligan on the goal allowed, but Uhelski turned aside the next 17, including a pair of high-percentage chances. A good debut for the former-Charger-turned-RedHawk. LINEUP: Uhelski was a surprise in net but Blasi said earlier this week that Larkin was the primary starter. On defense, 2017-18 regular Chaz Switzer was scratched, as was part-timer Grant Frederic. Freshman Andrew Sinard was the other blueliner who did not dress. Up front sophomore Christian Mohs and freshman Noah Jordan were casualties. 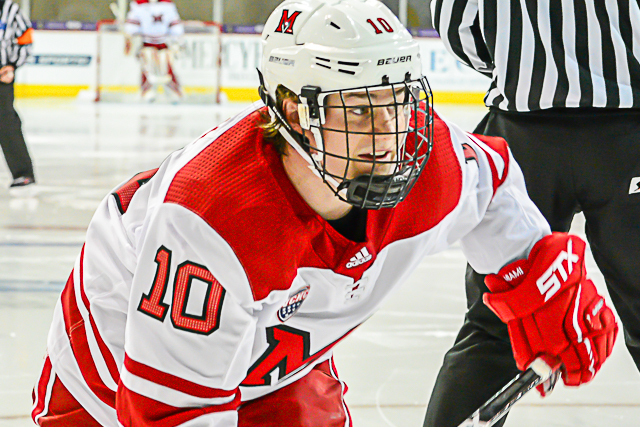 That means eight Miami players made their RedHawks debuts – six freshmen and graduates Rymsha and Uhelski. FINAL THOUGHTS: Alabama-Huntsville doesn’t look ready to challenge for an NCAA title but it was still a good win to open the season for MU. And by the way, the RedHawks’ last win in their season debut was 2013. With so many making their Miami debuts – both on the ice and the bench – getting victory under the belt has to provide a confidence boost. 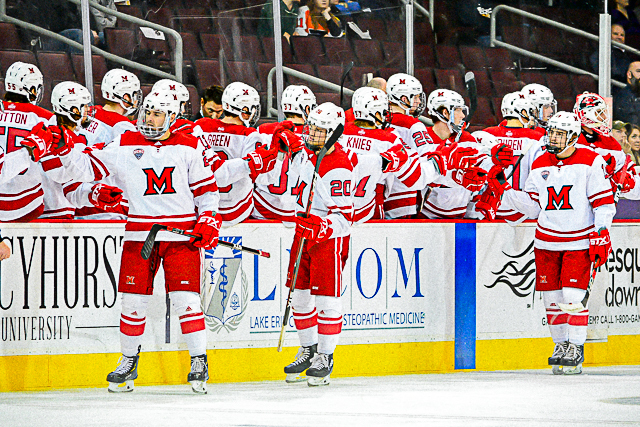 UP NEXT: Miami plays in the Ice Breaker Tournament in Erie, Pa., next weekend. 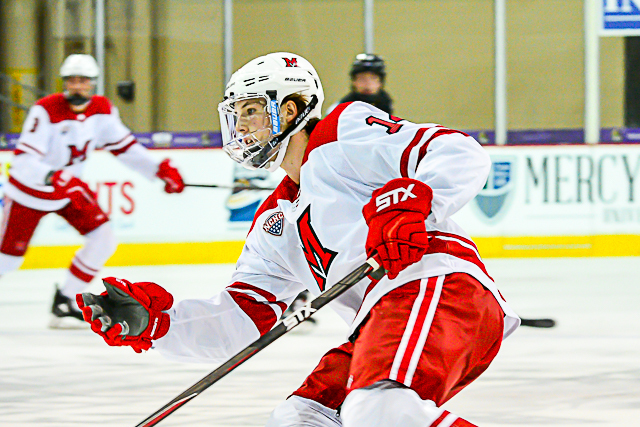 The RedHawks open with Providence at 4 p.m. on Friday and will face either Mercyhurst or Notre Dame on Saturday. 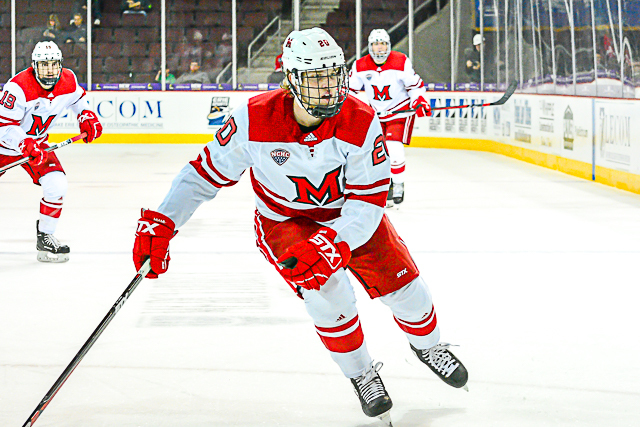 WHO: Alabama-Huntsville Chargers (12-23-2) at Miami RedHawks (12-20-5). WHEN: Saturday – 7 p.m.; Sunday – 3 p.m. ALL-TIME SERIES: Miami leads, 8-1. 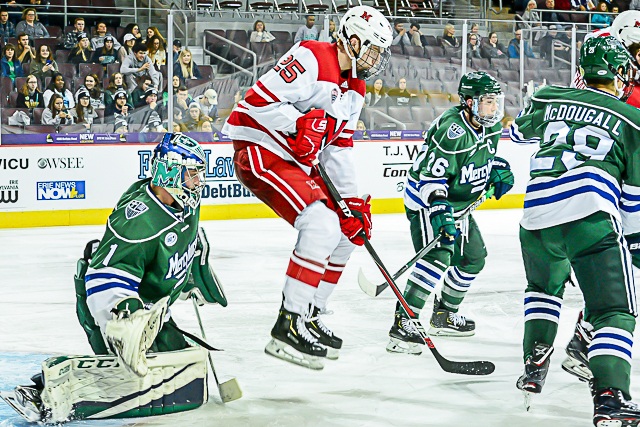 NOTES: Miami typically hosts a CIS (Canadian collegiate) team in an exhibition to open competitive play, but the RedHawks have no such luxury this season, heading straight into regular season action without a tune-up opportunity. 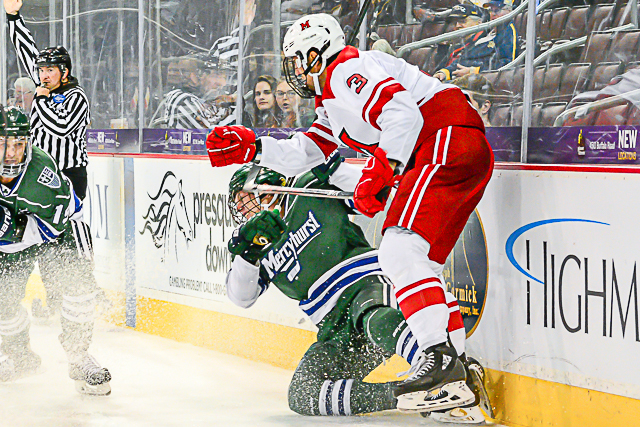 The last time these teams faced was in February 2012, when Miami swept UAH at Cady Arena. In 2010 these teams met in the first round of the NCAA Tournament, and the RedHawks prevailed, 2-1. Alabama-Huntsville lost its only two 20-point producers from last season, and Christian Rajic is the Chargers’ leading veteran forward with 15 points, nine of which came on goals. 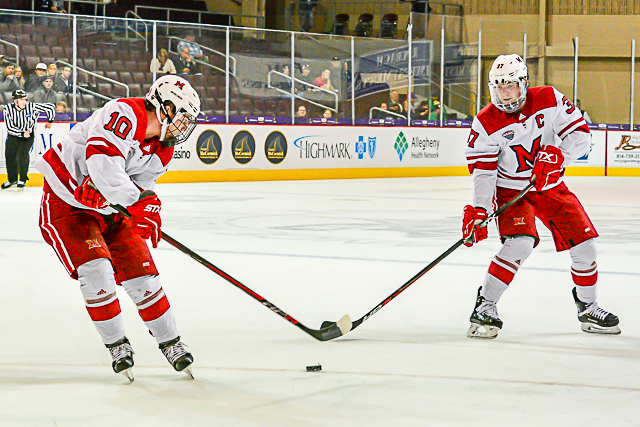 A pair of small forwards – Hans Gorowsky and Madison Dunn – netted five goals each and finished with double-digit points totals. Kurt Gosselin leads the blueline after scoring five times – three of which came on the power play – and notching 11 assists. John Teets and Cam Knight also return for their senior seasons after combining for 20 points in 2017-18. These teams have not met in six years and Miami is 2-0 vs. UAH at Cady Arena. OUT (2): Chase Munroe, Evan McCarthy. IN (1): Jordan Uhelski (graduate student). RETURNING (2): Jr. – Ryan Larkin; So – Grant Valentine. 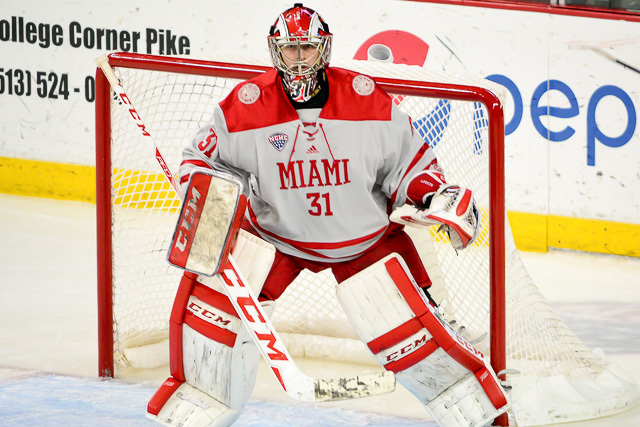 NOTES: Miami had four goaltenders on its roster last season but finished with a team save percentage of .874, its worst rate in Coach Enrico Blasi’s tenure. 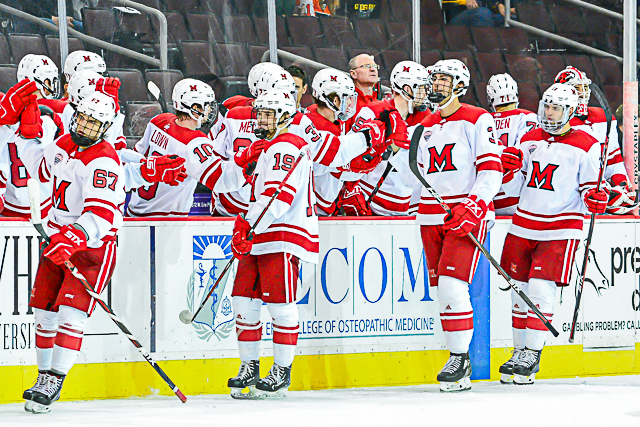 Only four teams in Division I allowed more goals than the RedHawks, who surrendered 128 for a per-game average of 3.46. It was a down year for Ryan Larkin, who stopped 91 percent of the shots he faced in 2016-17 but posted an .886 save percentage last season. The junior faced a lot of A-plus shots last season but he also let in a number of soft ones from outside. 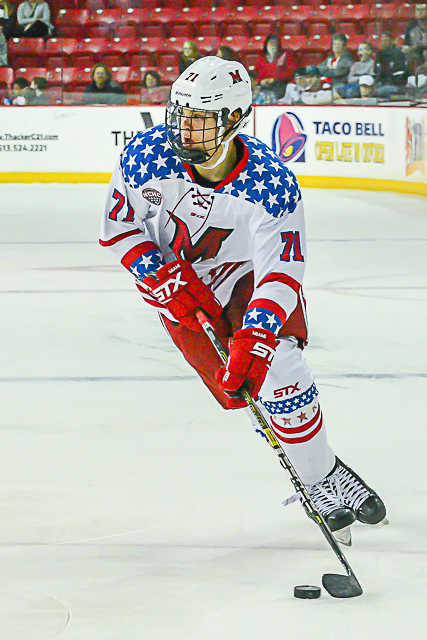 Larkin was on the ice for all but 85 of the RedHawks’ minutes, going 12-18-5 with a 3.12 goals-agaisnt average. His GAA was up 0.35 from his freshman season. 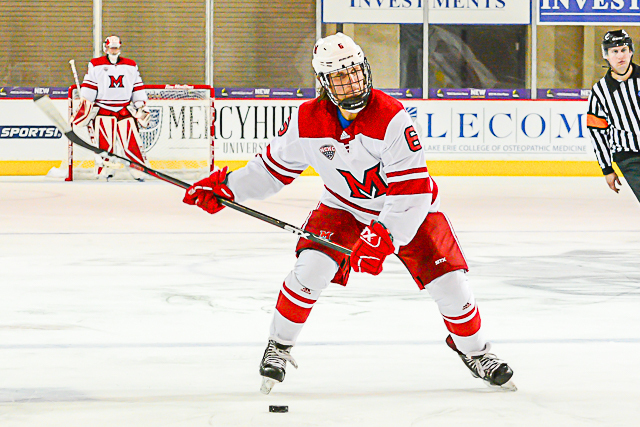 Jordan Uhelski completed his degree at Alabama-Huntsville and is joining Miami for his final year of eligibility. He has over 3,000 minutes of college experience and a career .906 save percentage. Grant Valentine, now a sophomore, saw just nine minutes of action and allowed one goal on three shots. With Uhelski coming in as a senior, Valentine has a chance to prove worthy of more time in net the next couple of seasons. With all three goalies being different classes, the Zatkoff Effect officially ends, meaning Miami has broken its cycle of having a freshman duo between the pipes every four years. 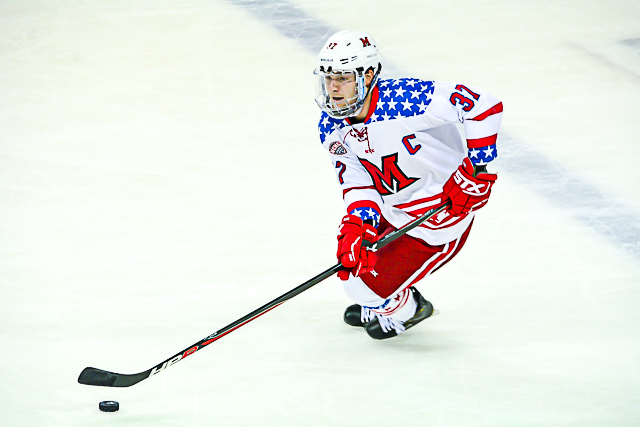 That trend started in 2008 when primary starter Jeff Zatkoff left following his junior season the same off-season as Charlie Effinger, forcing the RedHawks to bring in both Cody Reichard and Connor Knapp the following fall. Four years later it was Jay Williams and Ryan McKay, and four more after that Larkin and Chase Munroe were freshmen, but Munroe did not return to the team this season.